Taylor's Sweet Little Art and Nerd Site: Painting of the Day- Battle Armored Baddies! I am a big fan of classic illustration works from the Masters of the Universe toyline. Earl Norem, Rudy Obrero, and William George's paintings have inspired me to no end. 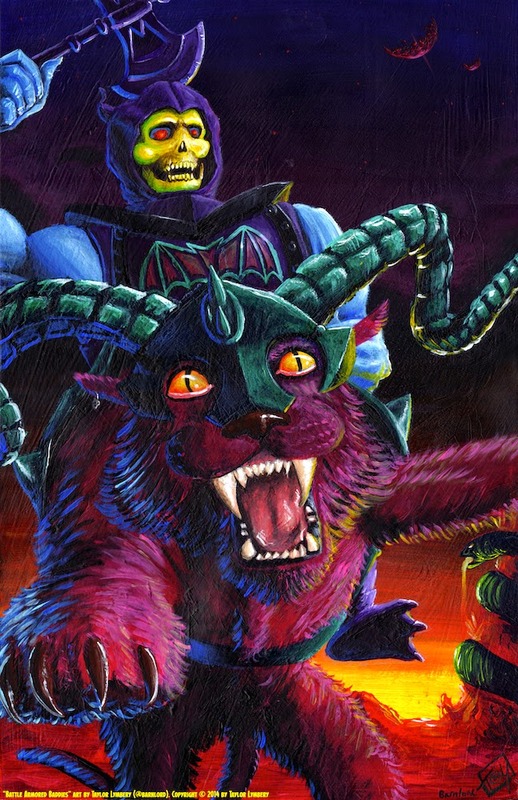 For this piece, I really wanted to capture the classic look of Skeletor and his great cat, Panthor. I decided to do Battle Armor Skeletor and pair him with the new Classics Panthor helm to give his battle cat an armored look as well. I broke up the proportions a little on Skeletor to give him perspective but to also mimic the squatty-ness of the original toys. Snake Mountain in the background is a nod to how the MYP 200X series took care of the evil fortress. To keep the same classic appeal, I colored the snake in green much like the snake trap of the vintage playset. I have been adding an easter egg to my paintings of recent. I've hidden a tiny gray skull in the piece. There is also a tiny gray skull in my pieces, "Dragon Camp", and "Deep Space Drifter". Why a gray skull? I am a huge Masters of the Universe fan and I love Castle Grayskull! I will offer this piece as aprint at the upcoming Dallas Comic Con in May 2014. This piece is an acrylic painting on a 11" X 17" piece on poster cardstock. You can see this piece in my deviantart gallery as well here. Dallas Comic Con is this week! You can find my table in Artist Alley at A229. Stop by!